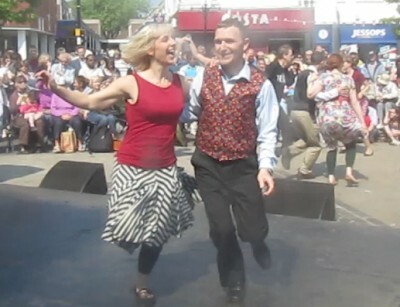 Scottish Dancing (Lochaber Lassies), Balkan Dancing, and Irish dancing. 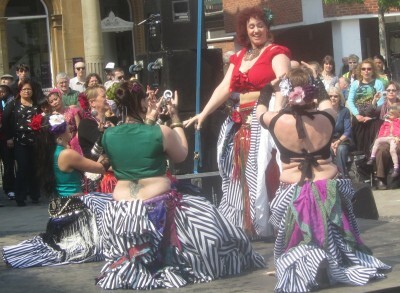 Next Saturday there will be dancing with Mr Hemmings Traditional Abingdon Morris Dancers and visiting groups. 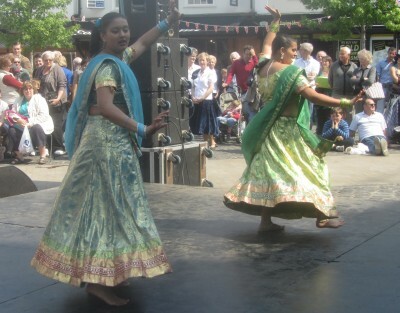 They begin at about 10:30am at the White Horse pub, make their way to town via other pubs and dance on the Market Place from around noon. The 4000 buns were cooked at Millet’s Farm, and delivered to the Town Council offices with a throng of photographers in attendance. 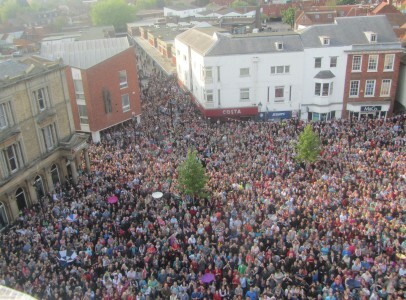 Quite a few people were there for the occasion. The Town Clerk was reckoning on about 2000 in the morning, but it was double that number. 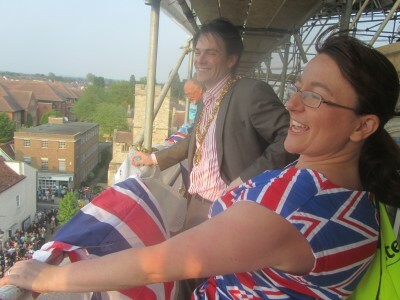 Abingdon’s youngest ever Mayor, Duncan Brown, threw the first bun. It went almost as far as Costas. 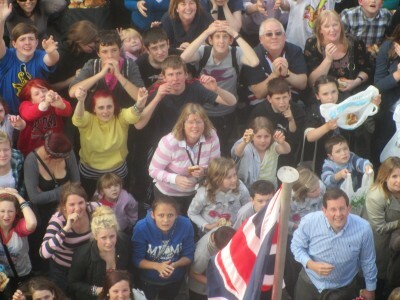 The crowd had seen the wedding of Will and Kate, and had gathered for a unique Abingdon tradition - catching buns. - in which the real fun is the anticipation. The crowd was so big and so vast and so huge that none of the throwers could reach all of them. 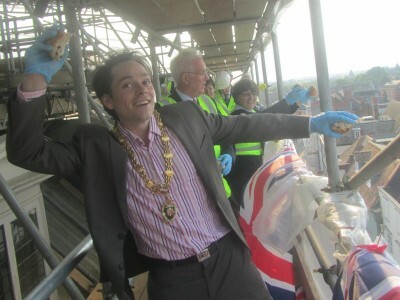 After the bun throw councillors got back into hard hats and hi-vis jacks for the descent through – what is – a building site at the County Hall. 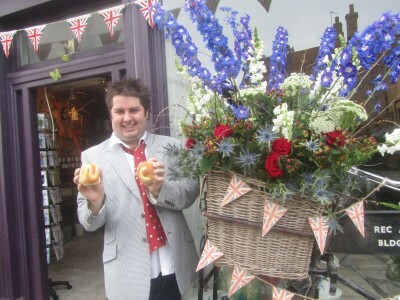 The new Cafe ‘Throwing Buns’ had an excellent day. 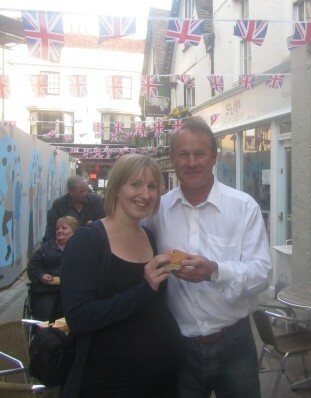 The lady in charge of Throwing Buns is seen here with Steve King who put up that bunting you see with the aid of a ladder at 7am this morning. 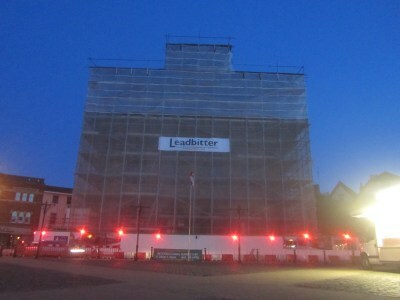 The police were called at that early hour because they thought somebody was after some lead from the roof. 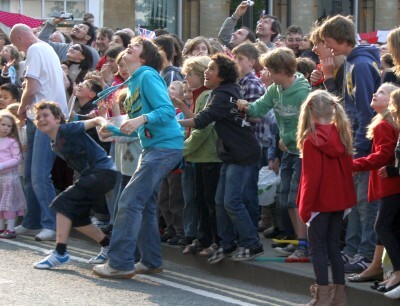 All of this could only ever happen in a town called Abingdon. 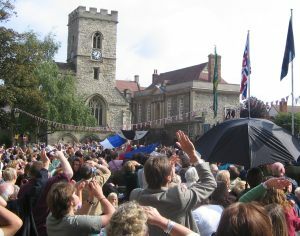 The stage is set for the Bun Throwing Ceremony and many shop windows have been making the most of the chance to celebrate. 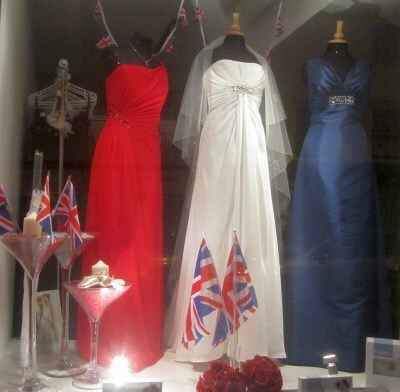 Fantasia Bridal have red white and blue wedding dresses. 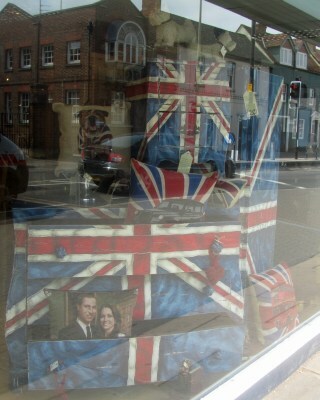 Abode in Coxeters have Wills and Kate framed by a red white and blue Union Jack. 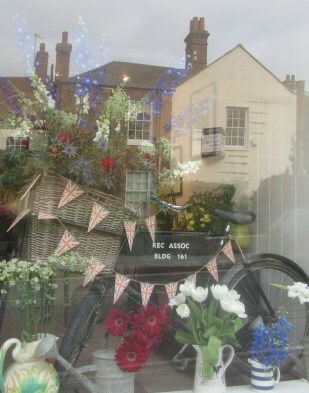 And Fabulous Flowers have Red White and Blue flowers. 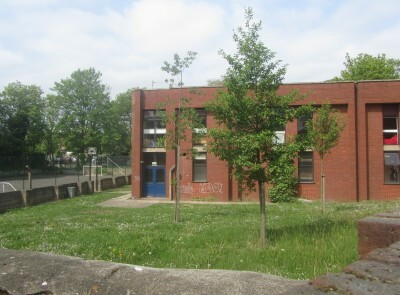 Anybody who has been near the NET Young Peoples Centre – off the Stratton Way – will have seen that a lot of building and decoration work has been carried out in the last two months. As I understand it the upstairs area is being converted to offices for various youth and child services. Presumably the 1970’s observation hole in the middle has been filled in to allow this conversion. Other youth centres in Oxfordshire are threatened with closure in the hope that the ‘Big Society’ will take them over, but the NET is being converted to what is termed a HUB. As I understand it, the downstairs area will continue as a youth centre – in the evenings at least, but the emphasize will be on targeting those most in need, and offices for people involved with such work. 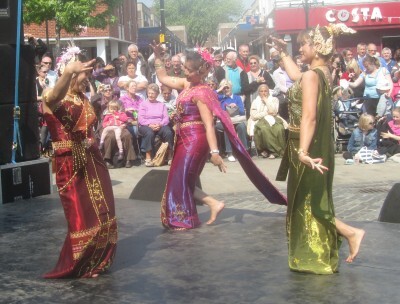 This coming weekend will be the annual Quasimodo Fair in our twin town, Argentan, and as every year a couple of people from the twinning society, and a couple of civic guests, are going across. 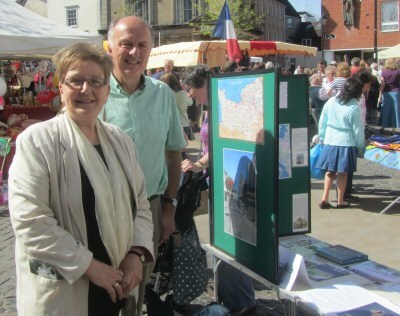 This year Ann Dodd – pictured with Peter – will be one of the twinning society members. Unfortunately she will miss the bun throw on Friday as a consequence. 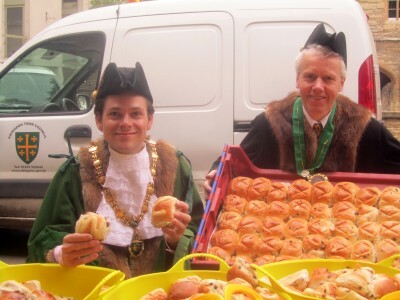 The Bun Throw will be at 6.00pm on Friday 29th April – a few hours after the Royal Wedding proper. There will be an essential safety briefing for councillors, freemen, and the raffle winner, a little while before the throw. 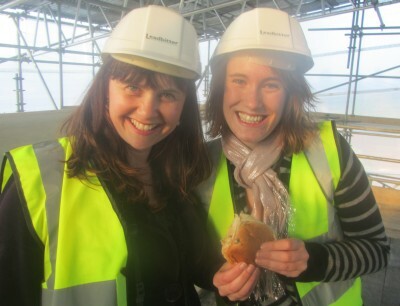 Buns will be thrown from the scaffolding just below the level of the roof.